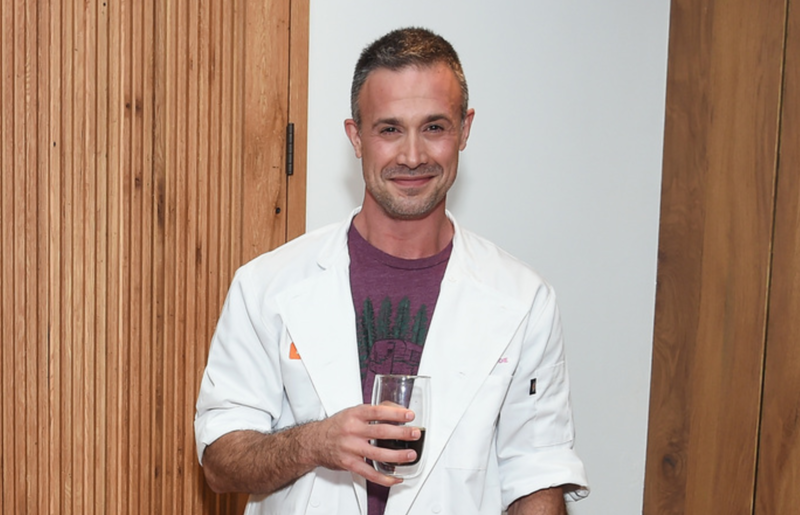 When it comes to the kitchen, Freddie Prinze Jr. knows he's all that. The 41-year-old actor said he's taking a break from acting to focus on his newest venture -- cooking. In June, Prinze Jr. released his first cookbook, "Back to the Kitchen," which is full of 75 family-friendly recipes from his New Mexico roots. It's not just another celebrity cookbook, Prinze Jr. told CBS News during a cooking demo in New York City, where he revealed his Green (Chile) Eggs and Ham, a twist on the Dr. Suess childhood classic. Prinze Jr. has a history of cooking. "My mother worked in restaurants her whole life," Prinze Jr. said. "That's where she met my father, at a comedy club in Reno, Nevada. She was the chef there." Growing up, Prinze Jr. said he learned many life lessons "in front of a stove." "That's where my passion about that came," Prinze Jr. said. Prinze Jr. recently partnered with Dunkin' Donuts cold brew coffee packs to share his love of coffee and to get families back to the breakfast table, a routine he has worked hard to develop in his own house. Here's what Prince Jr. had to say about his new cookbook "Back to the Kitchen," his unique childhood and his 15-year marriage to Sarah Michelle Gellar. First, I'd love to talk a little about your new partnership with Dunkin Donuts. You mentioned that you're a "coffee addict." "Addict" is a negative term. We will use "lover" -- passionate lover of all things coffee. It was a really easy partnership. My cookbook is about saving time. I have sauces that are easy prep sauces that work for 10 or 12 different dishes. That's the whole philosophy behind the Dunkin' brew coffee packs. It's investing two to five minutes in your evening to save you 30 minutes in the morning. This is the perfect product for me to team up with, because their philosophy on how to survive and mine are identical. It's all about prep to save yourself time. Also, you have a cookbook, "Back to the Kitchen," out. It focuses on minimal ingredients and it's family-oriented. Everything is nine ingredients or less and two of those ingredients are salt and pepper so that doesn't count. I try to make everything very simple. A lot of walkaway food, meaning you put in 20 minutes of work and walk away for 90 and do whatever you want. [There are] a lot of easy things with my sauces that go with a lot of different meals so you can mix it up. Probably my Holy Bleep Pulled Pork Tacos. How about your favorite ingredient to use? Favorite ingredient to use is probably New Mexico hatch chile, but it's not available that often. A lot of people think, "Oh, Freddie Prinze Jr., the actor," but you're now putting a lot of focus into cooking. Where does your inspiration for cooking come from? I learned about my father in front of a stove. I learned about heartache and heartbreak in front of a stove. There was this girl who stood me up on a date in high school and I was just ripped in two and my mom said, "Teenage girls don't want like nice boys like you. They want to date jerks. But when you grow up, you're still going to be a nice guy and all those girls that grew up are going to be looking for that. And there's only going to be about seven nice guys left, so you're going to have your pick." You said your wife, Sarah Michelle Gellar, is very supportive of your career. A lot of people think you two as a "power couple." What do you think of that label? I've never looked at us that way. Over a decade ago, probably in the '90s, when a lot of the Brits came over and started editing our magazines we didn't have a royal family, and our president and his kids weren't exciting so they turned Hollywood into the royal family and started commenting on their personal lives as if it was news and not entertainment. And that's all it is. At this point, actors and musicians and athletes get dehumanized to the point where they're stalked and hunted like wild game. Everyone has these tags and terms and people don't realize what they're doing. Even with personal lives, people want to be entertained, but I've never committed to that. When people say things like "power couple," my brain mutes it. She's my wife. I'm her husband. We're trying to raise two kids and do what we do best to make a living and provide a future for our family. How do you balance everything -- between acting, hosting a podcast and now being a published author? I've really stepped away from the acting. I don't really do that anymore. I [have a] podcast with Josh Wolf. It's called "Prinze and the Wolf." I've always had a soft spot for stand-up comedians ... Josh and I did his "Fairly Normal" podcast and when it was over, I knew it [was right]. We clicked so well. We started two weeks later. I love it. He's a good, good man. We approach things from the complete opposite end of the spectrum and end up in the same place. Do you have anything else you want your fans to know? If you want to reach out to me, I'm easy to reach out to. I try to communicate with just about everyone out there that hits me up on social media. If you say nice stuff or mean stuff, it don't matter, whatever you need to do that makes you feel good, makes me feel good.